Celebrating the natural flavour of good ingredients is something often forgotten about in the world of food. And onions, perhaps more than any ingredient, fall foul of our proclivity for masking flavours. 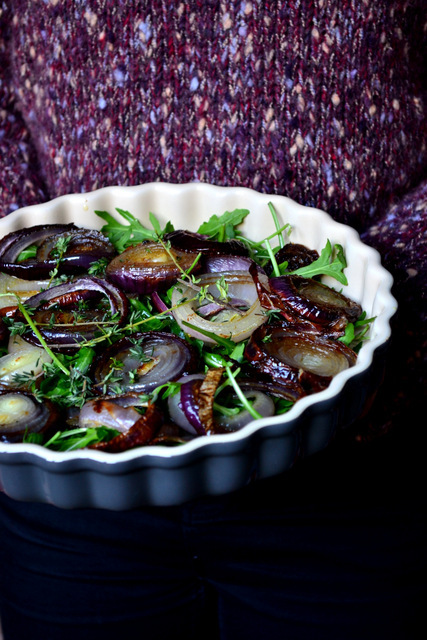 This recipe for Roasted Red Onion Salad, however, highlights the natural sweetness of the vegetable, combining it with peppery rocket for a simple and mouth-watering salad. Onions, though great for bulking, are often overlooked as an ingredient to showcase. But the caramelised, sweet and nutty flavour of onions is actually one of my favourites. 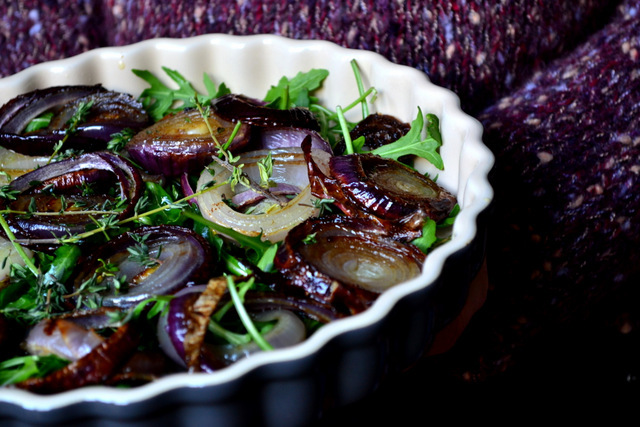 Roasted red onions make an attractive salad too, with their vibrant rings of purple, intersposed with pure white flesh. Offset against a bright background of green, a roasted red onion salad makes an eye-catching side dish. 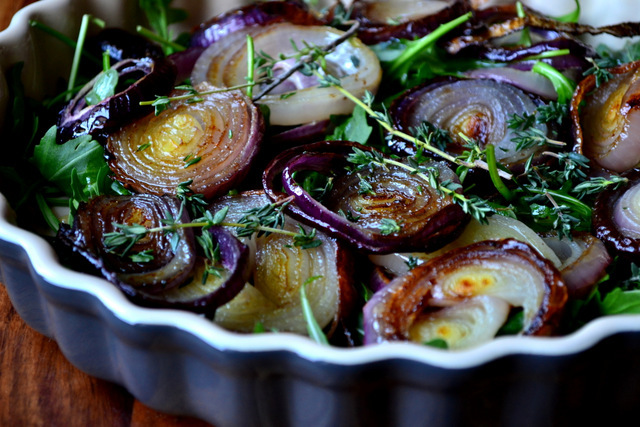 Not much can go wrong when roasting onions, just don’t bring them out too early. You should be aiming for a soft consistency all the way through. You could, if you have enough time, roast them for longer at a lower temperature. But there’s no need. Thickly slice the onions in rings, leaving them intact. Transfer to a baking sheet, drizzle with oil and bake at 200C/180C(fan) until soft and slightly caramelised. Fill a salad bowl with rocket and place the onions on top. Pour over the residual oil and finish with a few sprigs of fresh thyme. Cost: Onions are cheap. There are few cheaper ingredients. Rocket is relatively inexpensive too. All of this amounts to a salad that should set you back no more than 80p. Thank you – simple too! Who doesn’t like carmalised onions?! Sounds good! Thank you – and I agree. You can’t go wrong with a caramelised onion. Oh this looks good! I love onions – onions should be in the starring role sometimes – thanks! Lovely Nick. However, I have a question. Which came first, the jumper or the salad? They go so well together. Haha – a complete coincidence, I assure you. My mum bought it for Katherine this past Christmas. She just so happened to be wearing it when I was shooting. Frugal, you’ve outdone yourself! Perfectly roasted, beautifully photographed. I loooove red onions! This looks delicious! I’m loving this sweater theme! Oh, yeah, and the onions look great, too. Haha – thanks. It was just a coincidence! Yum 🙂 Red onions are so cheap as well. Delicious and beautiful and am loving the co-ordinated sweater! Thank you – some are saying it was a contrived co-ordination. It was not!